One minute we’re basking in the heat of what felt like a never-ending summer, and the next we’re scraping ice from frosty windscreens as 2018 comes to an end. December is often a very busy time for all, as we frantically organise everything that needs to be done before the start of a well-deserved festive break and the New Year. 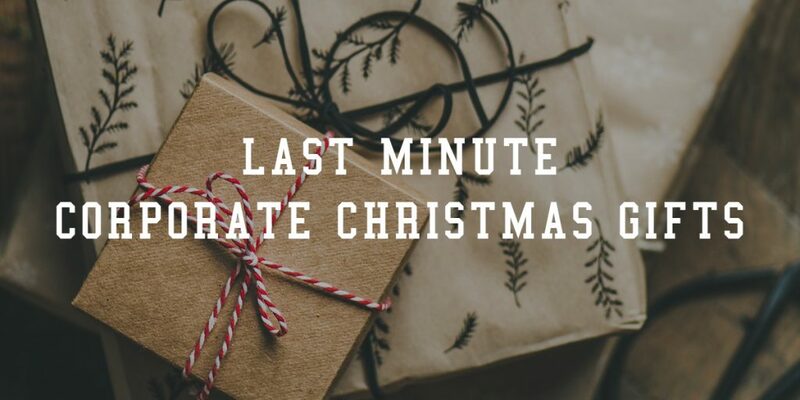 Many companies find themselves leaving corporate Christmas gifts for staff and clients until the last minute, forcing them to choose something which is either overpriced and generic or simply undesirable. 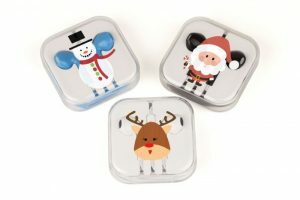 Here at USB2U, we have come up with a range of inspirational ideas for companies looking to giveaway Christmas gifts personalised with their logo, with solutions to suit every budget. What’s more, as we print these products in our warehouse in the heart of the UK right here in Northampton, we can turn around Christmas gifts such as branded USB sticks or power banks in just 24 hours, so it’s never too late to get into the festive spirit! 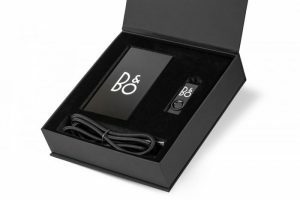 Audio gifts are never out of the way, and these personalised earphones are a desirable promotional product with a tiny price tag (but epic sound!). Epic Earphones from USB2U are versatile and offer a great branding area for that special festive message. Starting at roughly £1.00 per unit*, this is a cheap corporate Christmas gift that won’t break the bank! Wireless chargers (sometimes known as QI or inductive chargers) are the must have promotional product for 2019. 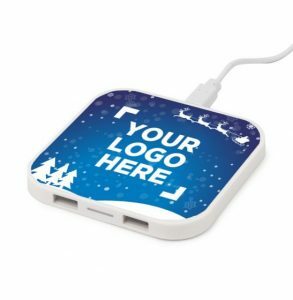 Go all out and print the Duo Wireless Charger with a special winter themed design, or simply print with your company logo so that your brand will always be front of mind. This product will be positioned pride of place on your customers’ desks, so the £4* investment will give you a great return for your money all year round. Christmas is the one time of year that many businesses get to show their appreciation for the time, money and loyalty given to them by their customers over the past 12 months. What better way to say thank you than with a luxury Christmas gift, such as a festive gift set tailored just for them. The Large Black Flip Box from USB2U oozes quality, and can be filled with useful tech gifts such as car phone holders, power banks and USB sticks that will be used every day, branded with your company logo. Executive gifts don’t need to be boring, and this gift set definitely has the wow factor. Priced from £5* upwards, you can fill your executive gift set with personalised goodies to suit your budget and target audience. We hope these last minute gift ideas give you some inspiration on how to say ‘thank you’ at this very special time of year, and as always, if you have any questions or just want some advice on what to go for,ask for a quick quote, call or email our friendly team who will be more than happy to guide you in the right direction.